This case study involved an application by the Wide Bay Burnett Conservation Council (WBBCC) for a declaration and an injunction to restrain an alleged contravention of an approval under the EPBC Act for the Paradise Dam. The Paradise Dam (previously called the "Burnett River Dam") is a major dam with a storage capacity of 300,000 megalitres constructed on the lower Burnett River approximately 80 km southwest of Bundaberg in Queensland. The respondent to the litigation was Burnett Water Pty Ltd, which owned and operated the dam. 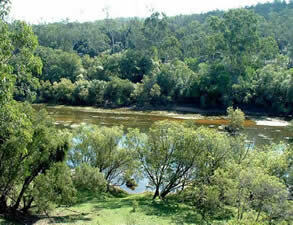 The Burnett River contains one of only two known endemic populations of the Australian or Queensland lungfish, a species that is well over 100 million years old, and listed as vulnerable to extinction under the EPBC Act. 3. Burnett Water Pty Ltd must install a fish transfer device on the Burnett River Dam suitable for the lungfish. The fishway will commence when the dam becomes operational. Burnett Water Pty Ltd installed an unstream fishway and separate downstream fishway on the dam but WBBCC alleged these were not "suitable for lungfish". A series of pictures showing the dam and the fishways is available here. The trial was orginally listed for 4 weeks commencing on 7 September 2009 but on the first day of the hearing it was adjourned until 9 November 2009 after the respondent applied to the Federal Environment Minister to amend the condition on which the case is based. The Minister subsequently refused to amend the condition. The proceedings commenced in late 2008 and the trial was held on 9 - 23 November 2009. Due to the illness of one of the witnesses, it was adjourned part-heard until 1 February 2010. The judgment was reserved for over a year before being delivered on 4 March 2011. The Court dismissed the application. Referral of the Paradise Dam by Burnett Water Pty Ltd dated 28 August 2001. Minister's decision that the dam is a controlled action and decision on assessment process under the EPBC Act on 31 August and 3 September 2001. Paradise Dam Environmental Impact Study (EIS) in Ocotober 2001. Minister's decision to approve the dam on 25 January 2002. 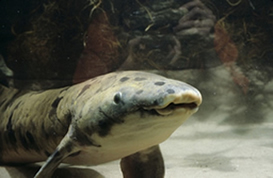 Minister's decision varying the approval on 8 August 2003 to include conditions to mitigate impacts on lungfish. Application filed 7 October 2008. Statement of Claim filed 7 October 2008. Directions orders on 7 November 2008 regarding progress of pleadings and interlocutory motions. Request for Further & Better Particulars of the Statement of Claim filed 12 November 2008. Further & Better Particulars of the Statement of Claim filed 19 November 2008. Defence filed 28 November 2008. Request for Further & Better Particulars of the Defence filed 2 December 2008. Further & Better Particulars of the Defence filed 6 February 2008. Notice of Motion for stay. Burnett Water's submissions for stay. WBBCC's submissions in reply to motion for stay. Judgment of Logan J dismissing application for stay: Wide Bay Conservation Council Inc v Burnett Water Pty Ltd  FCA 1900. Notice of Motion for discovery. WBBCC's outline of argument for discovery. Burnett Water's reply to motion for discovery. Directions orders made by Logan J ordering discovery. Affidavit of Reginald Thornton (standing) [without annexures]. Affidavit of David Kreutz (dam survey) and pictures of dam and fishway from annexure DCK-2. Affidavit of Professor Jean Joss and annexed preliminary report on the impacts of restricted passage for lungfish at Paradise Dam. Motion for particulars of recklessness filed by the Burnett Water. Burnett Water's outline of argument in support of motion for particulars. WBBCC's outline of argument in reply. Judgment of Logan J striking out statement of claim: Wide Bay Conservation Council Inc v Burnett Water Pty Ltd  FCA 237. Amended Statement of Claim filed 14 April 2009. Motion to strike-out discretionary factors in the Amended Statement of Claim. Burnett Water's outline of argument. Judgment of Logan J striking out discretionary factors : Wide Bay Conservation Council Inc v Burnett Water Pty Ltd (No 3)  FCA 540. Defence to the Amended Statement of Claim filed 1 June 2009. Reply filed 15 June 2009. Judgment of Logan J awarding indemnity costs for adjournment of trial: Wide Bay Conservation Council Inc v Burnett Water Pty Ltd (No 4)  FCA 1013. Amended Application filed 3 August 2009. Further Amended Statement of Claim filed 3 August 2009. Defence to the Further Amended Statement of Claim filed 3 August 2009. Amended Reply filed 17 August 2009. Further Amended Reply filed 23 November 2009. Expert report of Jim Tait on lungfish. This report was rejected by the Court for covering wider issues than those on the pleadings and difficulties distinguishing fact from opinion: Wide Bay Conservation Council Inc v Burnett Water Pty Ltd (No 5)  FCA 1320. Exhibit 4 - Graphs of percentage of total time the Paradise Dam upstream and downstream fishways operated between 28 November 2005 and 24 May 2009 based on particulars provided by Burnett Water Pty Ltd on 11 June 2009. Note: Over 4000 documents were disclosed by the parties prior to the trial. These were reduced to an Agreed Bundle of 800 documents for the trial (printed in 15 volumes). Of these, 105 exhibits were tendered at trial in addition to scores of documents annexed to witness statements. Many of these documents are not published here because they remain subject to copyright. Decision in Wide Bay Conservation Council Inc v Burnett Water Pty Ltd (No 8)  FCA 175 dismissing the application. 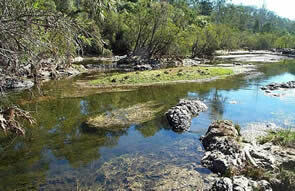 Decision in Wide Bay Conservation Council Inc v Burnett Water Pty Ltd (No 9)  FCA 661 awarding costs to the respondent. DEEDI (2012), Paradise Dam Downstream Fishway Monitoring Final Report. 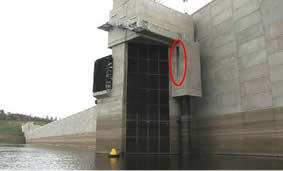 DEEDI (2011), Paradise Dam Upsteam Fishway Monitoring Final Report. Part of the Burnett River flooded by construction of the Paradise Dam. (prior to construction of the dam). 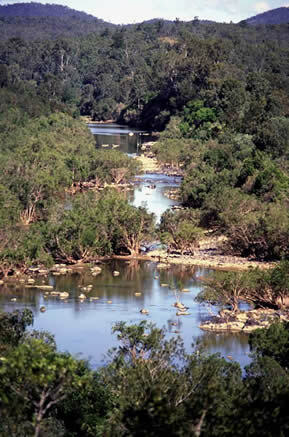 Photo: Andrew Berghuis (2003), "Migratory Fish Communities at the Proposed Burnett River Dam Site"
Riverbed of the Burnett River at the site of the Paradise Dam wall in September 2002 (prior to construction of the dam). Adapted from DPIF (2008) "Paradise Dam Downstream Fishway Monitoring Program - Annual Report - September 2008"
Paradise Dam water intake tower & entrance to downstream fishway in 2008. 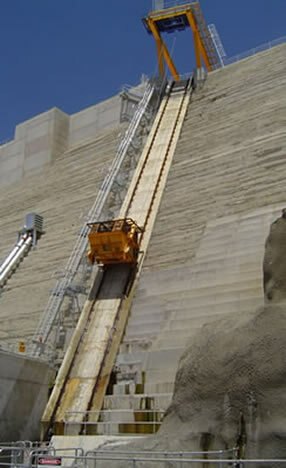 Upstream fishlift shown ascending dam wall during initial operation in 2006.